Praise for the previous edition: [Four stars]"Easy to read, memorize, and understand...This is an excellent review and study guide." 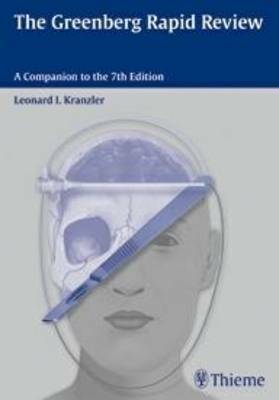 --Doody's Review A favorite among students, residents, and fellows, The Greenberg Rapid Review: A Companion to the 7th Edition is an indispensable review guide for anyone preparing for neurosurgery boards or rounds. Developed from the renowned annual Chicago Review Course in Neurological Surgery™, this must-have study manual brings active participation and efficiency to the learning and review process. Nearly 10,000 strategically sequenced questions and answers fully explore the breadth of neurosurgery and present complex subjects in an easily accessible manner. Each question directly refers by millimeter to a specific location in the Seventh Edition of the Handbook. Features * Nearly 10,000 highly relevant study questions, including 2,500 that are new this edition * Questions presented in a variety of formats -- true / false, multiple choice, and open-ended -- just like on the written board exam * Short answers appear on the same page as questions to save vital study time * New chapters cover neuroanesthesia, neurocritical care and stroke, neuroendovascular intervention, and much more * An emphasis on repetition and alternate arrangements of material fosters mastery of key concepts * Abundant mnemonic devices, helpful hints, and study charts aid comprehension and retention * A progressive withdrawal of cues forces users to recall more and more information This study guide is an essential resource for students, residents, fellows, or clinicians in neurosurgery, neurology, neuroradiology, or neuropathology as they review for boards or prepare for recertification exams.